Kemptown Apartment is in Brighton city centre, looking out onto an historic garden square with the sea beyond. Whether you prefer the hustle and bustle of a thriving city or enjoy a romantic retreat, this Apartment will fit your needs perfectly. It takes just 2 minutes to walk to the beach. Shops, delicatessens, restaurants, bars and pubs are seconds away. You can walk to the famous Pavilion, Brighton Pier and The Lanes & North Laine for fabulous shopping in just 5 minutes. Everything is accessible by foot – there’s no need for a car in Brighton. This Apartment is situated on the second floor of a Grade 2 Listed Regency building (circa 1825), built as a Hotel and continuing as such until the 1980s when it was converted into apartments. The majority of buildings on this square remain hotels as the location is so central. In the Apartment you'll find an entrance hall with entry phone, living room with 2 sofas (one converts to a bed), dining table seating 4 in a curved bay window overlooking the garden square. From here you can people watch or gaze at the sea with white sail yachts tacking across the water, seagulls whirling past the window. The living room is filled with light. Sit in the sunlight or watch dramatic stormy weather whilst enjoying your breakfast. A compact and well equipped kitchen leads off the living room. Here you’ll find everything you need for your food preparation whether cooking a meal from scratch or heating something in the microwave. The bedroom is generous and there's a Queen size bed (5') with crisp white linen, cushions and throws. The bedroom looks out across a romantic roofscape and the sun streams in during the afternoon. A clean white bathroom with large shower, large basin and WC leads off the hallway. Central heating and continuous hot water will keep you warm and cosy and are included in the rental price along with your linen and fluffy white towels. Free wi-fi is included so you can keep in touch with friends. For those who don’t know Brighton, it was made popular by George IV Prince Regent (1820-30) commissioning John Nash to build him a Pavilion as his seaside retreat to support his extravagant lifestyle and pursuit of pleasure. New Steine (the garden square the Apartment is on) was built to meet a growing demand for hotels by Royal followers who came to party and ‘take the waters’. As our building was a hotel at that time, who knows who may have stayed here! Brighton is a year-round seaside destination retaining its reputation for fun and culture. Buoyed by 2 Universities and boasting 12 theatres, 20 art galleries and 30 nightclubs it also has more restaurants per head outside London and a celebrated gay scene. You could easily while away a few days looking at Brighton's 3450 listed(historic)buildings, or window shop with its mix of mainstream outlets, independent boutiques and antique shops. The biggest arts festival in England is held here in May and something's going on every month throughout the year. Brighton has a funky creative energy and is quintessentially English. Whatever your age, there's something for everyone in Brighton. By basing yourself here, you can explore the South Coast and save money on London Hotels by travelling on the train in under an hour. Brighton station is 15 minutes walk or 5 minutes by taxi. Trains arrive at London Victoria running several times an hour all day every day. If you fancy a day trip to France, there’s a bus on the doorstep taking you to Newhaven where you can hop on a ferry. Gatwick Airport is nearby, for flights to all European destinations. Brighton Marina offers boating and fishing trips and there are windsurfing and sea-kayaking schools on the beach. Brighton has so much to offer it's too much to list so Google the City and see what you fancy doing- the world's your oyster. And you can always just kick back, listen to music, read, explore the local pubs, and most importantly, relax. The Apartment is on the second floor of a Regency building, there are 6 steps up to the front door and 2 further flights of stairs to the Apartment(2 floors up from ground level). Unfortunately there is no lift. We must mention that because of the property's central location there's sometimes a little noise from people walking home after a night out. When you arrive you will be met by our Housekeeper Claire, who will welcome you into the flat and answer any questions you might have on arrival. 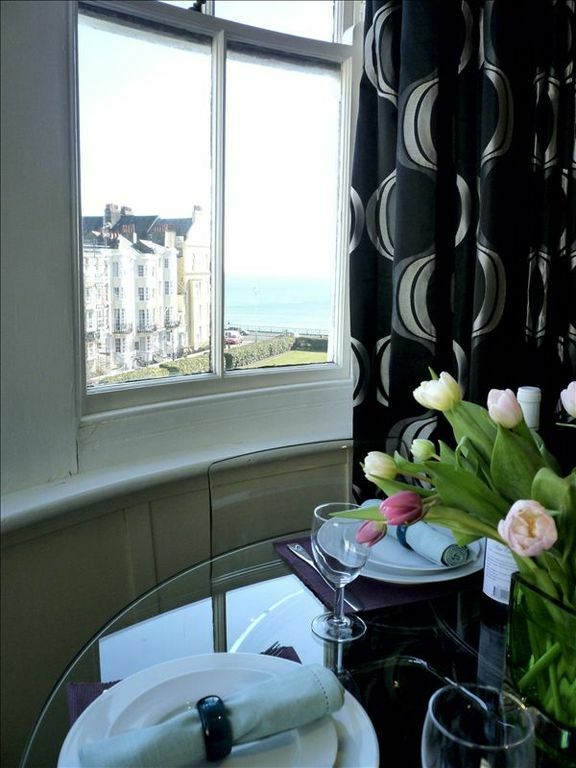 Brighton is very popular year-round for weekend breaks and this is reflected in the weekend short stay price. Midweek short stays and bookings for a full week or longer represent very good value. Our minimum booking is for 3 nights. If you have any questions, please visit the FAQ page on our website (link below 'Rates' section). Do, of course, email me for exact prices for your length of stay and anything else you need to know. Below are some comments from our Guest Book. We hope you enjoy your trip to this unique City, and find it both stimulating and restorative. Hi - I'm Jess and live in North London with my partner. This Apartment in Kemp Town is the oasis we escape to as often as we can. The sight of the sea dissolves any stresses and worries that build up in London. We've owned the Apartment since January 2010, and been happily renting to visitors since April 2010. We look forward to welcoming visitors from the USA and worldwide to what we think is a special destination. Many of our friends have moved from London to Brighton, commuting daily (hence its nickname ‘London on Sea’). We love coming here - the mood's relaxed yet there’s a real vibrancy and buzz. This exact location is central yet calm - very close to everything but not feeling like everything's on top of you. The garden square allows more light and gives a feeling of space, of green and of peace. We enjoy feeling like we live here and love sharing everything this City and our Apartment has to offer. Fantastic waking to the sun, making tea while people watching. All life is here, and you can take whatever you need from it. Brighton for me is at its best in the winter months - sea mists, dramatic storms rolling in suddenly, running down one of the streets leading to the sea, diving into a pub with a roaring fire. Walking back to the cosy Apartment to watch the sea with hot tea and crumpets. We use the Apartment as both retreat and cultural base - accessing nightlife and restaurants when we feel like it, with romantic walks along the beach and breakfast in a cafe when we want to recuperate. Oh - and I LOVE the shopping! Large shower, wash basin and toilet. 2 sofas. Flat screen TV with DVD player. Plates, cutlery, serving dishes. Baking trays, saucepans and cooking utensils provided. Dining table seats 4 comfortably. Flat screen wall mounted to position as suits. Can be watched from the dining table. Local guides and maps provided. Selection of novels. A selection of DVDs is provided for those cosy nights in. It's a cute little apartment, well laid out and stocked with everything one might need. The windows in the bedroom, kitchen and living room open to allow for a nice, cooling breeze as the temperature rises. Plus, it's one of the quietest apartments I've ever been in. We never heard anything from the other people in the building, and closing the windows at night eliminated the cries of the seagulls which can get quite loud. The bed and pillows were comfortable, but the living room sofas--not so much. Good thing we didn't spend a lot of time sitting around. The description lists clothes dryer, but it’s a rack. It works well enough--you just have to be proactive so you can have your clothes clean and dry when you want them. Brighton is a great town for tourists--lots to see and do, with plenty of nearby sites to visit on a day trip by train or bus. We enjoyed hiking at Devil's Dyke and touring the castle in Arundel. St. James Street (the main street around the corner) might seem a bit...iffy? at first, but as we got to know the area and meet people that live and work there, we came to love it for its liveliness and vibrancy. Be sure to visit The Lanes and North Laine, and a ride on the hop-on, hop-off bus will help you get a look at much of what Brighton has to offer. All in all, this was a great first visit to England for us.